If they were used smartly — to reach more of your Fans with your content — you’d hardly know they were there. If they were used judiciously — to reach non-Fans in a polite way to introduce value — you’d even occasionally embrace the existence of ads in your News Feed. But today’s Facebook marketers are giving News Feed ads a bad name. And they’re making me irritable. If I don’t know you, do you really think it’s a good idea to invade my News Feed with a sales push supported by some too-good-to-be-true grand proclamation? You’re making users hate News Feed ads. That makes it difficult for those who use them intelligently to actually use them. I have no idea who this guy is. It’s entirely possible that he’s legit. He may just be a very nice guy. He may have an incredible rags-to-riches story. But because he’s someone I don’t know, I have very little patience for his presence in my News Feed. I assume he’s a slimy scam artist. I don’t trust his too-good-to-be-true story. I don’t trust him. You know what I would have trusted? If he had advertised to my News Feed looking like a normal guy. Not someone bragging about how much money he made. But sharing something valuable instead of trying to sell me something. Instead, I see this ridiculous photo you see above. And I’ve seen it over and over and over again. It makes me hate this guy. And it makes me hate News Feed ads. What he’s doing is the equivalent of knocking on my door or calling my phone to sell his crap. What I’m saying is the equivalent of Get off my lawn! or Take me off your calling list *CLICK*. Look, I hate being the Facebook police, but this should be common sense. You should understand the sales funnel by now. People who are your Facebook Fans are in that sales funnel. Don’t start forcing non-Fans down it prematurely. If someone has liked your Page, you undoubtedly already share an occasional post that sells something. Such people should have little issue with these posts. Feel free to promote such posts to your Fans only. And yes, you can still do this. People are very protective and territorial when it comes to their News Feeds. If you’re going to trespass, you’d better be sure you’re there to provide value. And “providing value” doesn’t mean selling them some get-rich-quick scheme. It means looking like a friendly face who is there to help. If you’re going to promote in the News Feeds of non-Fans, do me a favor and avoid posting anything that includes a currency symbol or a call to action that leads to a conversion. Think I’m going too far? Maybe you can get creative and do this without looking like scum. But it’s my rule of thumb. 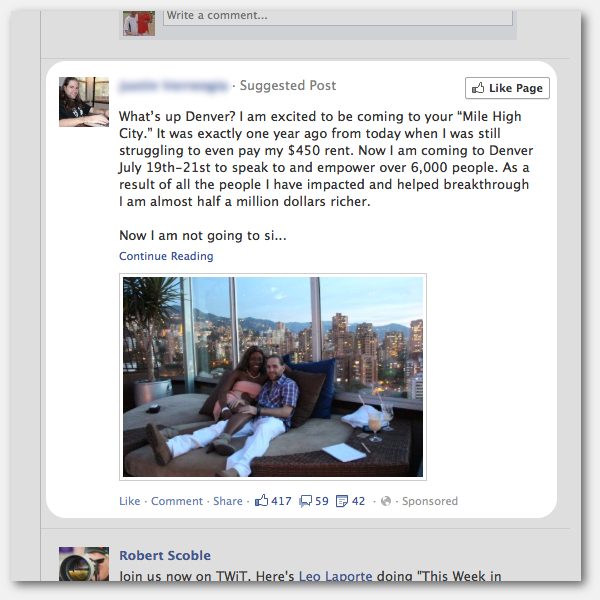 What do you think of News Feed ads? Do you target non-Fans? Let me know in the comments below!